BACKGROUND AND PURPOSE: Although embolization with detachable coils is an accepted alternative to surgical clipping, a major long-term problem is aneurysm recanalization due to coil compaction. Liquid embolic agents are a possible alternative as filling material that might decrease the recanalization rate. We evaluated the use of a liquid embolic for endovascular treatment of intracranial aneurysms. METHODS: During 1999–2003, 10 patients with 11 small aneurysms (group 1) and 29 patients with 30 large or giant aneurysms (group 2) were treated with a liquid embolic. Of 32 female and seven male patients, 20 had mass effect and two had subarachnoid hemorrhage; 17 were asymptomatic. All aneurysms were judged unsuitable for regular treatment; selective embolization was performed with a liquid embolic alone or with coils and liquid embolic. Stent placement was performed in 15 cases. Clinical and anatomic outcomes were assessed with the Modified Glasgow Outcome Scale and with angiography at 3, 12, and 24 months. RESULTS: In group 1, good or excellent outcome and complete occlusion were observed in all patients. In group 2, clinical outcome was good or excellent in 26 patients and fair in one, and death occurred in two patients (one procedure related and one disease related). Technical complications occurred in four patients in group 1 (one permanent neurologic deficit) and in four patients in group 2 (one patient died, two remain hemiparetic, one remains asymptomatic). Follow-up images showed two recanalizations in group 1 and nine in group 2. CONCLUSION: Selective embolization with a liquid embolic is useful to treat aneurysms unsuitable for coiling or for patients in whom previous treatment failed. This mostly applies to large and giant aneurysms in which morbidity and mortality rates are better than those associated with surgery, and the recanalization rate is lower than that previously described with coiling. Endovascular treatment of intracranial aneurysms has made remarkable progress over the past 10 years and has become widely used. Selective embolization using detachable coils is now accepted as an alternative to surgical clipping that presents lower morbidity and mortality rates in selected cases (1). However, neurointerventionalists face a major problem in the long-term course, and that is aneurysm recanalization due to coil compaction. These recurrences occur in 10–21% of patients (2, 3). Several studies (4–8) showed that the rates of recanalization or incomplete treatment are well correlated with the size of the aneurysm or its neck. Indeed, platinum coils only occlude a small portion of the volume of the aneurysm, with significant residual dead space. The use of liquid embolic agents is a possible alternative as filling material for the treatment of some intracranial aneurysms, and it might decrease the rate of recanalization (9–11). The Cerebral Aneurysm Multicenter European Onyx (CAMEO) trial (11) recently reported successful treatment of mostly large and giant aneurysms by using selective obliteration of the sac with a liquid embolic (Onyx; Micro Therapeutics, Irvine, CA). Anatomic and clinical results are very encouraging, with a high rate of stable occlusion. The aim of our study, which is not a part of the CAMEO trial, was to prospectively evaluate the clinical and angiographic findings in patients with intracranial aneurysms treated by means of selective embolization with a liquid embolic in a single center. 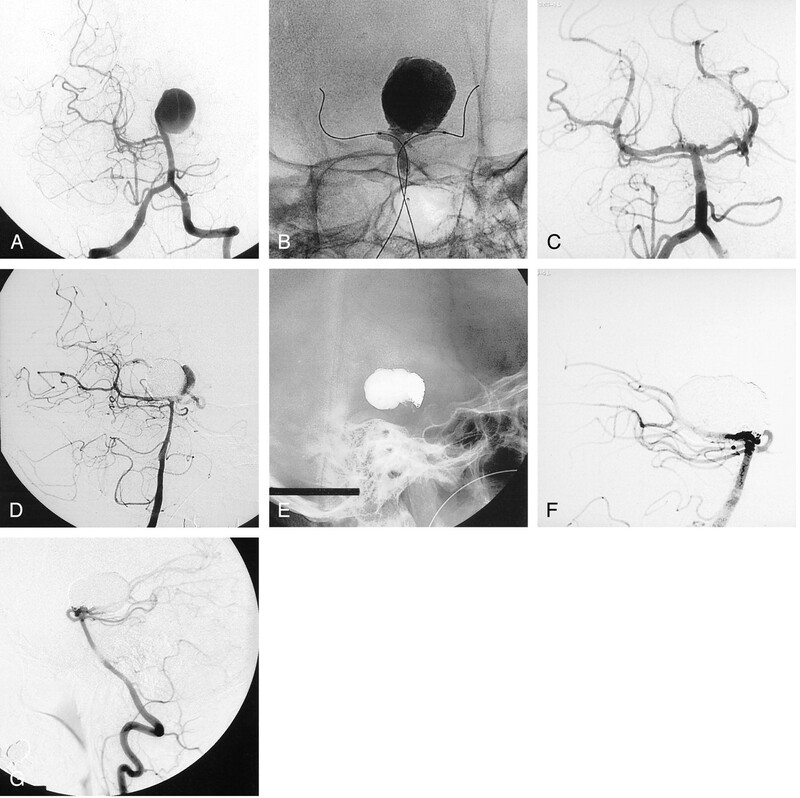 Between June 1999 and September 2003, 39 patients with 41 intracranial aneurysms were treated in our department by means of selective embolization with a liquid embolic (Onyx; Micro Therapeutics). There were 32 women and seven men with a mean age of 50 years (range, 35–81 years). Twenty patients presented with symptoms of mass effect including loss of visual acuity, diplopia, cranial nerve palsies, and hemiparesis. In 17 patients, the aneurysm was asymptomatic and incidentally discovered on brain images. Two patients were admitted as an emergency for subarachnoid hemorrhage (SAH) and were classified according to the Hunt and Hess scale (12): one patient was grade 2, and one was grade 4. All patients underwent conventional angiography of both carotid arteries and vertebral arteries. Table 1 shows the location of the aneurysms: all aneurysms but two were located in the anterior circulation. Aneurysms were classified according to their size as follows: small, less than 12 mm; large, 12–25 mm; or giant, greater than 25 mm. Multiple aneurysms were seen in two patients. Therapeutic alternatives were discussed between the neurosurgical and neurointerventionnal teams. Indications for endovascular therapy in our patient group mainly concerned the anticipated surgical difficulties due to aneurysm size, neck width, or location. Indications for selective embolization with a liquid embolic in our patient group concerned intracranial aneurysms that were judged by the senior author (J.M.) to be difficult or unsuitable for regular endovascular or surgical treatment: large and giant aneurysms with unsuccessful test occlusion, small aneurysms with very large neck (> 5 mm), or recanalization of a previously clipped or coiled aneurysm. Contraindications to endovascular treatment with the liquid embolic were technical impossibility to completely seal the aneurysm neck with the balloon, or branches arising from the aneurysm sac or close to the neck. All patients signed an informed consent form before treatment. 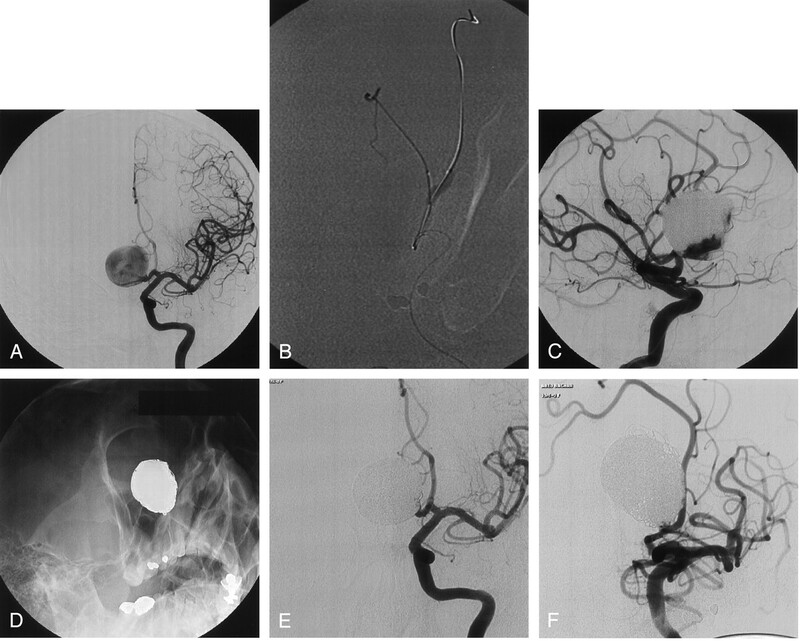 Small aneurysms were treated by selective embolization with a liquid embolic alone, and these patients composed group 1. Patients with large and giant aneurysms, group 2, underwent treatment with a combination of detachable coils and liquid embolic. Patients with previously clipped or coiled aneurysms that manifested recanalization were placed in group 1 or 2 according to the size of the aneurysm. In group 2, our first therapeutic strategy consisted of coil deposition in three-quarters of the aneurysm fundus, which allowed for partial aneurysm thrombosis and decrease of mass effect, followed by delivery of the liquid embolic at the aneurysm neck 2 months later. This strategy was applied in six patients, then we changed our therapeutic approach because of technical difficulties to seal the neck with the liquid embolic, leading potentially to higher risks. Liquid embolic was thus first delivered to obliterate three-quarters of the aneurysm sac and then coils were used to safely occlude the aneurysm neck 2 months later. A balloon-expandable stent was used in 13 patients (to reconstruct the dysplastic arterial wall of the parent vessel) during the first procedure and in two patients during repeat treatment. In case of intracranial stent placement, medical pretreatment was begun 2–5 days before the procedure with aspirin 250 mg/day and clopidogrel 75 mg/day. In all patients, the endovascular treatment was performed with the patient under general anesthesia and systemic heparinization. The adequacy of systemic anticoagulation was monitored by frequent measurements of the activated clotting time (ACT). A baseline ACT was obtained before the bolus infusion of heparin 5000 IU and hourly thereafter. The bolus infusion of heparin was followed by a continuous drip of 2000–3000 IU/hr, with the purpose of maintaining the ACT between 200 and 300 seconds. Patients were given intravenous aspirin 250 mg at the beginning of the procedure. Systemic heparinization was prolonged for 48–72 hours after treatment. Bilateral femoral access was obtained through percutaneous femoral artery punctures, and two 6F guide catheters were inserted into the parent vessel. In all patients, the first step of the endovascular procedure consisted of a “seal test” to confirm that the liquid embolic could be delivered within the aneurysm lumen without risks of migration into the cerebral circulation. A remodeling balloon (Equinox, HyperGlide, or HyperForm; Micro Therapeutics) was positioned across the aneurysm neck, and another microcatheter was simultaneously placed inside the aneurysm. During balloon inflation, contrast material was injected under road mapping within the aneurysmal sac to confirm the absence of any leakage into the parent artery, which was defined as a positive seal test. Patients with a negative seal test (n = 12) were not treated with the liquid embolic and were excluded from the present study. In 15 cases, a balloon-expandable stent was placed across the aneurysm neck. Two types of stent were used (INX or Cerebrence; Medtronic AVE, Inc., Santa Rosa, CA), and their dimensions varied from 3.5 to 4 mm in diameter and from 12 to 18 mm in length. Intraarterial nimodipine (before stent navigation: 2 mg in 5 minutes; during and after stent delivery: 2 mg in 10 minutes) was administered before, during, and after stent placement to prevent vasospasm during its navigation. A 0.018-inch microcatheter was placed past the aneurysm neck. Then, a stiff exchange guidewire (Luge 0.014-inch/300 cm; Target Therapeutics, Fremont, CA) was introduced trough the microcatheter into the distal circulation. The microcatheter was removed, and the balloon-expandable stent was gently advanced over the wire and positioned across the aneurysm neck. Under road-map guidance, the balloon was inflated and the stent deposited. The guidewire and the balloon were removed, and a remodeling-balloon (Equinox, HyperGlide, or HyperForm; Micro Therapeutics), which is dimethyl sulfoxide (DMSO)-compatible, was placed inside the stent and kept deflated. Through the second guide catheter, a 0.014-inch DMSO-compatible microcatheter (Rebar 14; Micro Therapeutics) was navigated over a guidewire through the stent struts inside the fundus of the aneurysm. Depending on the therapeutic strategy, coils or liquid embolic was delivered first to occlude the major part of the aneurysm sac. Technique of coil embolization has already been described in the literature (13, 14). For delivery of liquid embolic, the dead space of the microcatheter was filled with 0.27 mL of the solvent DMSO to prevent precipitation of the liquid embolic within the lumen of the catheter. The aneurysm was obliterated slowly and progressively by using small injections (0.1–0.2 mL/min) of 20% liquid embolic (20% ethyl vinyl alcohol/80% DMSO) while simultaneously inflating the balloon across the aneurysm neck. The polymer solidified within 2 or 3 minutes, during which time the balloon remained inflated (maximum 5 minutes). After the last injection, the catheter was aspirated to avoid any possible injection of liquid embolic that may still be within the lumen of the catheter. The average time required for these procedures was 3 hours (range, 2–7 hours). After endovascular treatment, patients were transferred to the intensive care unit where fluid balance, neurologic status, and blood pressure were carefully monitored. In case of intracranial stent placement, patients continued to receive clopidogrel 75 mg/day for a month and aspirin 250 mg/day for 1 year. Immediately after treatment, patients were evaluated with angiography to document aneurysm obliteration. Angiographic results were classified as follows: complete occlusion (no contrast material filling the aneurysmal sac), neck remnant (residual contrast material filling the aneurysmal neck), and residual flow (residual contrast material filling the aneurysmal body). Imaging follow-up consisted of conventional angiography at 3, 12, and 24 months. Follow-up angiograms were compared with angiograms obtained immediately after embolization and were then assigned to one of three categories: 1) further thrombosis, when the amount of contrast agent filling the aneurysm decreased; 2) unchanged, when a similar degree of aneurysm occlusion in multiple projections was found; and 3) recanalization, when an increase in the amount of contrast material filling in the aneurysm was observed. A senior neurosurgeon recorded the clinical course, including worsening of symptoms and death, at 3, 12, and 24 months after treatment. Clinical outcome was graded according to a modified Glasgow Outcome Scale (15), as follows: excellent (neurologically intact); good (mild hemiparesis, cranial nerve palsy, or other deficit that does not interfere with daily functioning or work); fair (significant hemiparesis, aphasia, confusion, or other deficit that interferes with daily activities or prevents a return to work); and poor (coma or severe neurologic deficit rendering the patient dependent on family or nursing staff). Conventional angiograms were reviewed for all patients by two senior neuroradiologists together (B.L., J.M.). A 39-year-old woman was complaining about headaches and underwent brain imaging. A left unruptured internal carotid artery (ICA) aneurysm was discovered, and the patient was referred to our department for endovascular treatment. 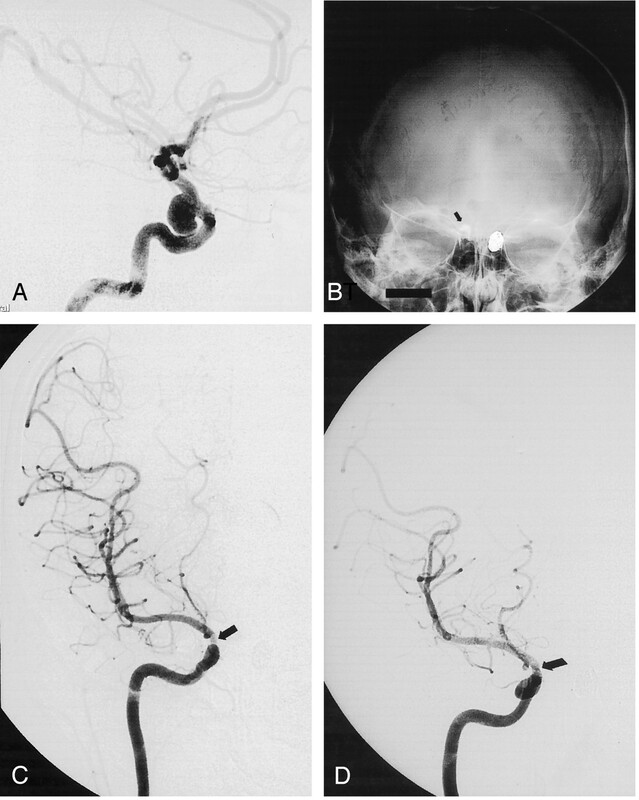 Conventional and 3D angiography (Fig 1A and B) revealed a small, bilobed carotid-ophthalmic aneurysm with a wide neck. A remodeling balloon was placed across the aneurysm neck. During balloon inflation, 0.53 mL of liquid embolic was slowly injected within the aneurysm lumen (Fig 1C). Conventional angiogram (Fig 1D) at the end of the procedure showed complete aneurysm occlusion. The patient made an excellent recovery and was discharged 5 days after the treatment. Follow-up angiogram at 24 months showed a stable, complete occlusion (Fig 1E). Incidental aneurysm discovered at MR angiography in a 39-year-old woman with headaches. 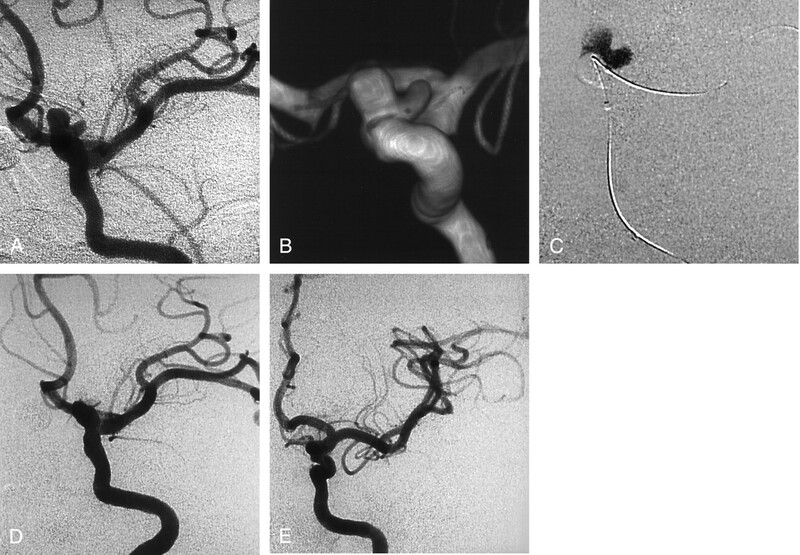 A and B, Left ICA conventional (A) and 3D (B) angiograms show a wide-neck bilobed carotid-ophthalmic aneurysm. C, Road map obtained during balloon inflation and delivery of liquid embolic. D, Follow-up angiogram obtained immediately after treatment shows complete occlusion of the aneurysm and patency of the ICA. E, Follow-up angiogram obtained at 24 months shows stable occlusion of the aneurysm. A 48-year-old man was complaining of headaches and underwent brain imaging including CT and then conventional angiography. Left ICA angiogram (Fig 2A) showed a 40-mm aneurysm of the anterior communicating artery. A remodeling balloon was positioned across the aneurysm neck to protect the parent artery. During balloon inflation (Fig 2B), 9 mL of liquid embolic was injected to fill three-quarters of the sac (Fig 2C). Then, coils were added to complete the aneurysm occlusion at the neck. Conventional angiograms (Fig 2D and E) at the end of the procedure showed complete occlusion of the aneurysm. The patient made an excellent recovery and was discharged 5 days after treatment. Follow-up angiogram at 24 months showed a stable, complete occlusion (Fig 2F). Incidental aneurysm discovered at MR angiography in a 48-year-old man with headaches. A, Left ICA angiogram shows a giant aneurysm of the anterior communicating artery. B, Road map obtained during balloon inflation at the aneurysm neck and delivery of liquid embolic. C, Follow-up angiogram shows liquid embolic fills the major part of the aneurysmal sac. Coils were then added to complete the aneurysm occlusion at the neck. D and E, Follow-up nonsubstracted (D) and substracted (E) angiograms at the end of treatment show complete occlusion of the aneurysm. F, Follow-up angiogram at 24 months shows stable occlusion of the aneurysm. A 48-year-old woman presented with symptoms of progressive hemiparesis, and brain imaging studies revealed a giant basilar artery aneurysm. Left vertebral angiogram (Fig 3A) showed a 30-mm aneurysm of the basilar tip. The aneurysm was treated by means of selective embolization with liquid embolic. Delivery of the liquid embolic was performed during inflation of two remodeling balloons (Fig 3B), allowing for safe neck control. Follow-up angiogram at the end of the procedure showed complete occlusion of the aneurysm (Fig 3C). The follow-up angiogram at 12 months showed partial recanalization of the aneurysm (Fig 3D). The patient underwent a second embolization with coils to safely occlude the aneurysm remnant (Fig 3E). Conventional angiogram at the end of the second procedure showed complete occlusion of the aneurysm (Fig 3F). Follow-up angiogram at 12 months showed a stable, complete occlusion (Fig 3G). Clinically, the patient has almost completely recovered from her hemiparesis. Basilar artery aneurysm in a 48-year-old woman who presented with symptoms of progressive hemiparesis. A, Left vertebral angiogram shows a giant basilar tip aneurysm. B, Nonsubstracted angiogram obtained during inflation of two remodeling balloons and delivery of liquid embolic. C, Follow-up angiogram obtained immediately after selective endovascular treatment with liquid embolic shows complete occlusion of the aneurysm. D, Follow-up angiogram obtained at 12 months shows partial recanalization of the aneurysm. E and F, Follow-up nonsubstracted (E) and substracted (F) angiograms obtained after a second embolization with coils only, show complete occlusion of the aneurysm. G, Follow-up angiogram obtained at 12 months after second procedure shows persistent complete occlusion of the aneurysm. A 36-year-old woman was complaining about headaches and underwent brain imaging that revealed bilateral ICA aneurysms. The left one was treated by means of selective embolization with coils. The right one was selected for endovascular treatment with liquid embolic. Conventional angiogram showed a small wide-necked supraclinoid aneurysm (Fig 4A). Nonsubstracted (Fig 4B) and substracted (Fig 4C) follow-up angiograms immediately after the procedure showed complete occlusion of the aneurysm and a nonsignificant ICA stenosis. Follow-up angiogram at 24 months showed a stable aneurysm occlusion and a discrete parent artery stenosis. Incidental ICA aneurysm in a 36-year-old woman. A, Right ICA angiogram shows a wide-necked supraclinoid aneurysm. B and C, Follow-up nonsubstracted (B) and substracted (C) angiograms obtained immediately after selective endovascular treatment with liquid embolic show the cast of Onyx (arrow in B), a complete aneurysm occlusion and a nonsignificant ICA stenosis (arrow in C). D, Follow-up angiogram obtained at 24 months shows stable occlusion of the aneurysm and a discrete ICA stenosis (arrow). This group comprised 10 patients with 11 small aneurysms, including four that were previously treated with surgical clipping or coil embolization. Nine patients presented with asymptomatic, unruptured aneurysms and one with SAH. All aneurysms were nonthrombosed and were treated by means of endosaccular obliteration with liquid embolic alone. The total amount of liquid embolic injected into the aneurysmal sac varied from 0.04 to 1.7 mL. Endovascular treatment resulted in 11 complete occlusions (Table 2), and overall clinical outcome was good or excellent in all patients. Procedure-related complications (four patients [40%]) occurred immediately in two patients and in a delayed fashion in two (Table 3). Immediate complications consisted of two cases of migration of liquid embolic into the posterior cerebral artery and the ophthalmic artery territories. One patient remained asymptomatic, and one had a persistent visual field defect because of a posterior cerebral artery infarct. Delayed complications were seen on the 3-month follow-up angiogram and consisted of two cases of nonsignificant stenosis of the parent artery due to liquid embolic lamination against the arterial wall during balloon inflation. These two patients remained asymptomatic. Morbidity and mortality rates related to the procedure were thus 10% and 0%, respectively. Mean duration of follow-up (Table 2) was 18 months and showed nine complete occlusions and two recanalizations (18%). Of these latter, one remained stable and one required retreatment with stent placement and a second delivery of liquid embolic. Follow-up angiography performed at 3 months showed a stable, complete occlusion of the aneurysm. This group comprised 29 patients with 30 aneurysms (23 large and seven giant), including four that were previously treated by surgical clipping or coil embolization. Twenty patients presented with symptoms of mass effect, eight with asymptomatic aneurysms, and one with SAH. Five patients had one large or giant partially thrombosed aneurysm. In 13 cases, a balloon-expandable stent was placed across the aneurysm neck to reconstruct the dysplastic arterial wall of the parent vessel. The total amount of liquid embolic injected into the aneurysmal sac varied from 2.1 to 9 mL. Endovascular treatment resulted in 19 complete occlusions, 10 neck remnants, and one incomplete occlusion (Table 2). Overall clinical outcome was good or excellent in 26 patients, fair in one, and two patients died. One patient experienced migration of the liquid embolic into the middle cerebral artery (MCA) territory that resulted in a significant hemiparesis, one patient died because of perforation of the vessel wall during balloon catheterization, and one patient died of bilateral MCA infarcts due to a severe cerebral vasospasm secondary to hemorrhage (grade 4 SAH). Among the 20 patients who presented with symptoms of mass effect, an aggravation was observed in three. These patients had nonthrombosed giant aneurysms and had persistent partial or complete third and/or sixth cranial nerve palsy. In the remaining 17 patients, the mass effect decreased or remained unchanged during clinical follow-up. Procedure-related complications (Table 3) occurred in four patients (14%) including two cases of liquid embolic migration into the MCA territory, one distal vessel perforation due to the guidewire that was used to place the stent, and one proximal vessel perforation with the guidewire during balloon positioning before coil deposition at the neck. Of these, one patient died, two patients had persistent hemiparesis (one mild and one significant), and one was asymptomatic. Morbidity and mortality rates related to the procedure were thus 7% and 3%, respectively. Mean duration of follow-up in 27 patients with 28 aneurysms was 14 months (Table 2). It showed 16 complete occlusions, three neck remnants, and nine recanalizations (32%). All recanalized aneurysms were giant and/or partially thrombosed lesions treated without stent. These patients are still under evaluation, and four of them were already retreated with stent plus liquid embolic (two cases), liquid embolic only (one case), or coils (one case). This study shows that selective embolization of intracranial aneurysms with a liquid embolic is feasible and effective in a selected population. Anatomic results and clinical outcomes are encouraging especially because the selected aneurysms were judged difficult or unsuitable for regular endovascular or surgical treatment. Selective endosaccular coiling is now accepted as an alternative option to surgical clipping that presents lower morbidity and mortality rates in selected cases (1). Technique of endosaccular coiling has been described in the literature (13, 14), and recent clinical series (4, 14) demonstrated that complete occlusion was possible for most small aneurysms with relatively low rates of recanalization. In our study, a complete occlusion was achieved in all cases. However, imaging follow-up showed a recanalization in two of 11 aneurysms; this is not superior to results obtained after selective embolization with coils in small aneurysms. Furthermore, we observed a procedure-related complication rate of 40%, although mostly asymptomatic, which is very high compared with those rates reported with endosaccular coiling. This may be explained by the selection of aneurysms in our group 1 that were judged difficult or unsuitable for regular embolization with coils or surgical clipping. In these lesions with a very large neck, some lateral slits (especially along the microcatheter) may remain unprotected during balloon inflation, and it is through them that liquid embolic can migrate into the parent artery. The technique of selective embolization with liquid embolic appears thus challenging and requires a great amount of experience in the endovascular treatment of intracranial aneurysms including the use of the remodeling technique (16). For all these reasons, we believe that this endovascular approach must not be proposed as a first-line therapeutic option in the care of patients with small aneurysms that are known to be well managed by endosaccular coiling. The natural history of untreated symptomatic giant intracranial aneurysms is poor (17, 18). Moreover, a recent clinical series showed that rates of bleeding in asymptomatic aneurysms correlate with aneurysmal size (19). However, few improvements have been made in the management of such lesions. Direct clipping of giant aneurysms is still associated with relatively high rates of procedure-related morbidity and mortality. However, selective endovascular treatment with coils rarely achieves a complete occlusion of the aneurysmal sac and this leads to regrowth of the aneurysm in long-term follow-up (4–8). Previous studies (20–22) showed that nonselective occlusion of the parent artery was the most effective technique in giant aneurysms, allowing aneurysm thrombosis and symptom resolution. Nevertheless, this approach requires the sacrifice of a major intracranial vessel and a successful test occlusion. To preserve the parent vessel, several authors have treated giant aneurysms by selective coiling (4–8). Their recent clinical series showed that this approach is not appropriate because of the size of the aneurysm and the high frequency of thrombus in the aneurysmal sac, which can embolize during manipulation of coils. Giant aneurysms also exhibit a high frequency of regrowth of the sac after using coils because of coil compaction (4–8). Furthermore, recent published series indicate that coiling in giant aneurysms may aggravate symptoms of mass effect (23). Liquid agents have long been considered for use in endosaccular aneurysm occlusion; despite that, control of their deposition can hardly be presumed (9). Mawad et al (10) reported the first series of 11 giant aneurysms successfully treated by selective obliteration of the sac with liquid embolic. Nine of the 11 patients showed an excellent outcome and absence of aneurysm recanalization at 6 months after the treatment. The CAMEO trial (11) recently reported an overall 90% rate of good or excellent outcomes in a series of mostly (79%) large and giant aneurysms. Procedure- or device-related permanent neurologic morbidity and mortality rates were 8% and 2%, respectively. These findings were confirmed in our study as we observed good or excellent outcomes in 26 (90%) of 29 patients and procedure-related morbidity and mortality rates of 7% and 3%, respectively. Anatomic results were also encouraging in the CAMEO trial with an overall 79% complete occlusion rate at 12 months. Angiographic follow-up in our group 2 patients showed recanalization in nine (32%) of 28 aneurysms. This difference may be explained by the fact that CAMEO results concerned aneurysms of all sizes including small aneurysms in which the recanalization rate was also lower in our series. Concerning the subgroup of partially thrombosed aneurysms, the five patients (group 2) showed recanalization during imaging follow-up. This remarkable group of aneurysms remains thus challenging when the parent artery cannot be occluded or when the covered stent technique cannot be applied. Nevertheless, our results compare favorably with those previously reported with coil occlusion in the same group of aneurysms (5–8). The CAMEO trial suggested that the adjunctive use of a stent may improve morphologic results. This was clearly confirmed in our study because none of the aneurysms treated with the combination of liquid embolic and stent showed a recanalization. The combined endovascular approach seems to give the best anatomic results over time. However, the flexibility of balloon-expandable stents is still a major concern and may limit navigation in tortuous vessels, illustrating the need for better stent technology. The aims of treatment in patients with large or giant aneurysms are to protect from SAH, cure symptoms, and eliminate mass effect. In our series, there was no bleeding after the treatment. Among 20 patients who presented with symptoms of mass effect, 17 had a decrease or a stability of the symptoms during clinical follow-up. Only three patients with a nonthrombosed giant aneurysm experienced an aggravation of the mass effect. Experiences, both neurosurgical and endovascular, have shown that nonthrombosed giant aneurysms can be particularly susceptible to swelling complications (24, 25). The severity of aggravation is directly proportional to the size of the remnant lumen and to the clot that may result after aneurysm thrombosis (25). The goals of treatment were thus achieved in most of our patients, suggesting that selective embolization with liquid embolic is an alternative option in case of difficult large and giant aneurysms. Nevertheless, additional technical innovations are necessary to improve the way to deliver the liquid embolic and its combination with protecting devices (balloon, stent) to decrease potential complications. Our study shows that selective endovascular obliteration with liquid embolic seems feasible, safe (considering the selected population), and effective for the treatment of intracranial aneurysms. The benefit of this new technique appears clearly for large and giant aneurysms. In these cases, the morbidity and mortality rates were better than those associated with surgical clipping. Furthermore, the recanalization rate was lower than previously described with endosaccular coiling, especially when liquid embolic is combined with intracranial stent placement. However, this approach remains technically challenging and must not be proposed as a first-line therapeutic option in small aneurysms for which coil embolization has proved its safety and efficacy. Accepted after revision June 16, 2004.